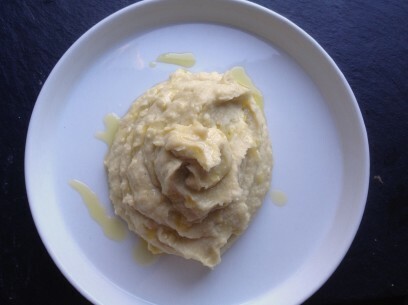 Skordalia is one of the most traditional dishes in all of Greece. It’s so so simple to make with a just few everyday ingredients and remarkably delicious – if you haven’t already, this one is a must-try! 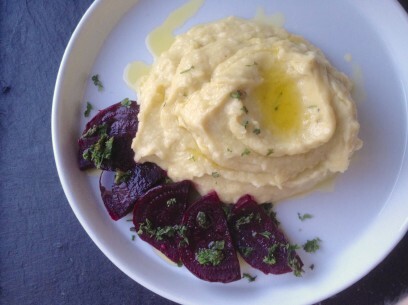 Often described as Greek garlic mashed potatoes, traditional skordalia is much more than that. Creamy, ‘buttery’ potato goodness with the pop of mashed raw garlic folded in – it’s indescribable really. And skordalia is in no way overwhelmingly garlicky, just almost peppery with that bite of raw garlic coming through the velvety potato. Have only 1 russet potato and a few cloves of garlic in the house? Then you’re about 15 minutes away from crazy amazing skordalia! Spread it on EVERYTHING or pair it with it’s bestie, a simple beet salad / pantzaria salata. However you choose to enjoy it, you’ll love every last bit! Russet potatoes are my-go to here. They boil up quick and fluffy and are usually a pretty good size each, probably 1/2 to 3/4 of a pound each. Peel and cut into small cubes and boil for maybe 6-8 minutes until super tender. While potatoes are on the stove, peel and mash in a mortar and pestle, the cloves of garlic and salt. Mash these into a smooth paste. Doesn’t take but a minute or two of good mashing. 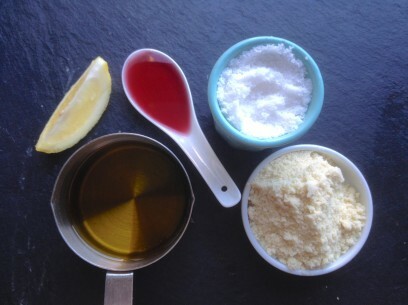 Measure out your almond flour, vinegar, olive oil and salt. Use a good quality red wine vinegar and good Greek olive oil. Don’t skimp on the quality of your ingredients here – thee are only a few so use the best you can find! And I like to sift my almond flour if I have an extra minute – helps to ensure maximum creaminess. Get your hand mixer plugged in and ready to roll and the minute potatoes are done – drain, transfer into a small bowl and mash with a fork. Quickly add your mashed garlic and IMPORTANT – gently fold the hot, mashed potato around the garlic paste. This lets the heat of the potatoes bring out all of the garlic oil in addition to softening it just slightly. The recipe here makes about 2 1/2 – 3 cups of skordalia. It is extremely easy to scale and I most often triple if serving 6 or so people. Always nice to have a little leftover for the next day too and skordalia will stay refrigerated and covered for up to 3 days. 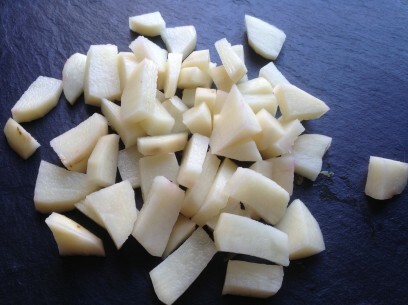 Peel and chop potato into cubes and boil in salted water (on addition to salt above). Boil for approx 6-8 minutes until very tender. 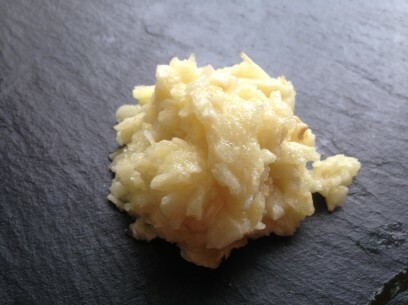 While potato is boiling, mash garlic and salt in a mortar and pestle until you get a smooth garlic paste. Set aside. Measure out all remaining ingredients and set aside. Get hand mixer ready. As soon as potatoes are done, drain and transfer to bowl. Mash with a fork and fold in garlic paste. Allow to sit for a minute and then whip them together for a minute with your mixer. Add the almond flour, mix for about 30 seconds and drizzle in your olive oil. Mix for 1 minute and add vinegar and lemon juice. Give a last mix and you’re ready to enjoy! ** As noted in the comments below, it’s imperative not to over mix your skordalia when using a hand mixer. You’ll end up with something closer to glue so keep to the one minute/30 second instructions above. OR feel free to go old school and mash by hand – I often do this for a chunkier skordalia and it’s just as wonderful! Serve with crusty or grilled bread or homemade pita chips. Also delicious with roasted beets or beet salad. If you use the mixer to long your skordalia will be like wallpaper glue. Mash and mix all by hand for the perfect authentic taste. Skordalia! Wonderful name for a wonderful creation. Might I suggest you add the phonetic spelling of dishes? When I serve this and other “The Greek Vegan” recipes to guests, I want to make sure to pronounce the lovely names properly. Thanks for all the scrumptious recipes. Yia Yia taught me, for a more “whipped” consistency, save the starchy water that you boiled your potatoes in and add a few drops at a time until you have the desired consistency. Works great for taramosalata, too!!! Is there anything you can recommend to substitute for the almond meal? I have a nut-allergic son, but I’d love to make this for my family! It sounds very much like something I used to buy at Whole Foods, but they no longer carry. Thanks! We have NEVER used almond or any type of meal! Still best ever! isn’t it amazing how many ways there are to make skordalia and they’re all so delicious?! I’ve tried a number of different variations and loved them all 🙂 Do you use potato or bread? My mom has always made skordalia with bread instead of potatoes. Do you have any suggestions as to how much bread to use instead of potatoes? Under the picture of mashed garlic, your instructions say to add almond flour. Your ingredients list almond meal. They’re two different things. I bought almond flour, and I believe it’s much finer than meal. Do you think I should use the same measurements? By the way, I made your cabbage soup and followed the instructions exactly. Awesome recipe, and a keeper! My girlfriend loved it and has been talking about it for days. You made me a hero! I’m making your beet dish for her next. Kali Orexi! Delicious!! I only made the potato part and had pickled beets on the side- amazing. Thanks again! I never made it with almond flour so I don’t have it right now but I do have almonds so I just wonder can I blend almonds and use that ? Fantastic! Didn’t have any ground Almonds or Almond meal so just ground whole Almonds, worked a treat, really enjoyed. I like to eat wholefoods so kept the skins on both the Almonds and Potatoes, if anything makes it more wholesome. Great!